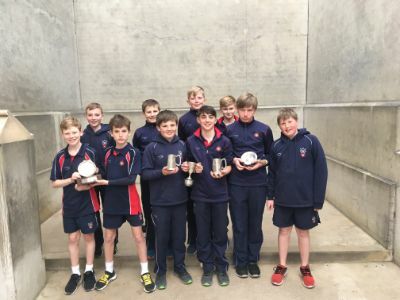 Yesterday saw a bit of Berkhamsted Fives history made over at Eton College for the 52nd Preparatory Schools Eton Fives Tournament. This is an invitational only competition and in the past, we had always been happy to get as far as winning the likes of one of the Plate competitions. Last year saw us reach the Final for the first time in 42 years where the boys just lost out 1 - 2; this year saw young Sam Kaynama & Barney Baines step up to the challenge and ended up walking away Prep Champions with a 12 - 9, 12 - 7 win putting Berkhamsted back on the trophy after 43 years. The good news didn’t stop there however, as Berkhamsted walked away with a further two Plate trophies in the form of the form of ‘The Jeremey Marston Salver’ and ‘The Roddy Forman Salver’ which were won by Sam Matthews & Felix Harris and Adam Yule & Max Phelps respectively. All in all, a remarkable achievement by our boys. Congratulations to all.